Vibrio cholerae is a gram-negative bacilli bacteria with a “comma” shaped body and a flagella for the movement. V. cholerae and V. mimicus are the only Vibrio spp. that do not require salt for growth. The string test may be performed on a glass microscope slide or plastic petri dish by suspending 18 to 24 hour growth from Heart Infusion Agar (HIA) or other non-inhibitory medium in a drop of 0.5% aqueous solution of sodium deoxycholate. If the result is positive, the bacterial cells will be lysed by the sodium deoxycholate or Sodium taurocholate, the suspension will lose turbidity, and DNA will be released from the lysed cells causing the mixture to become viscous. A mucoid “string” is formed when an inoculating loop is drawn slowly away from the suspension. String test is used to separate Vibrio spp. from Aeromonas spp. and P. shigelloides. String test is used to differentiate Vibrio cholerae (string test positive) from other Vibrio spp. 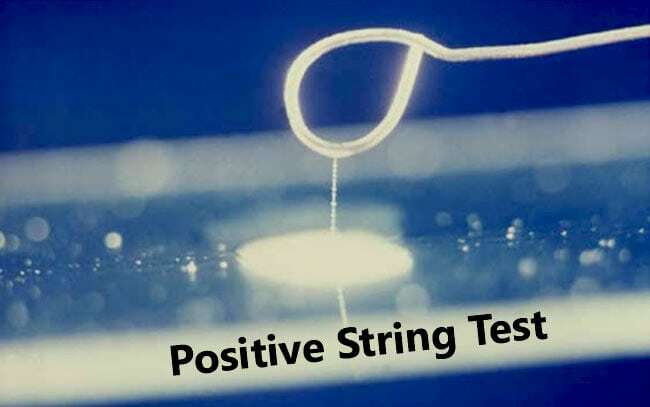 (string test negative). Take a clean grease free slide and add a drop of 0.5% sodium deoxycholate or Sodium taurocholate. Emulsify an organism in the slide using an inoculating loop. Keep on rubbing the loop vigorously for 2-3 minutes until the liquid appears viscous. Then, pull the inoculating loop upwards from the slide. Observe for a mucoid “string”. Positive Test: Appearance of String (thread like mucoid) when the loop is pulled upwards. Negative Test: No appearance of String when the loop is pulled upwards.